It was a dark and stormy night on the 13th of October 1977 … okay not really - it was actually quite a nice but cool late evening, as six intrepid III year members of 4 Squadron, under cover of darkness, gathered stealthily around the base of the Memorial Arch - Terry Wood, Kevin McCarthy, Wayne Murray, Steve Zuber, Mark Beaulieu, and Brian Pitman. In a moment of inspiration, Brian had concocted a “cunning plan” to help put their Squadron on the RMC map - to get their 15 minutes of fame. The idea was simple enough - climb the vertical face of the Arch, in the middle of a dark night and paint the Squadron number on the top. However, not surprisingly, the task seemed a lot more daunting as they stood in the cold night air staring straight up at the stone facing of this very imposing structure. Nevertheless, after a couple of tries, the team got things rolling when they managed to toss a ball of twine over the top of the Arch and down the other side. A much stronger rope was then attached and pulled up and over. Terry Wood, a wrestler with the necessary arm and leg strength, had “volunteered” to be the one to scale the wall, so the one end of the rope was tightly secured to his waist. Then with a tug, the team on the other side of the Arch drew the rope taught, allowing him to start the slow climb upwards. That process was even more effective than planned, since after the first third of the journey, they found they were also able to help pull him up rather than just adjusting and keeping the rope tight so he could climb. That was all great, until Terry reached the summit and realized not only that the team could not see him but also that he was still being pulled - only a “high-pitched” rather urgent yell from him averted an “undesired” outcome. Once on top, the painting supplies were brought up and from there the “chef-d’oeuvre” was completed. Fortunately, and thankfully, the trip down was uneventful. A couple of days later, on the 15th, Kevin who had his private pilot’s license rented a plane and with Terry flew over and took photographic evidence of their daring deed. 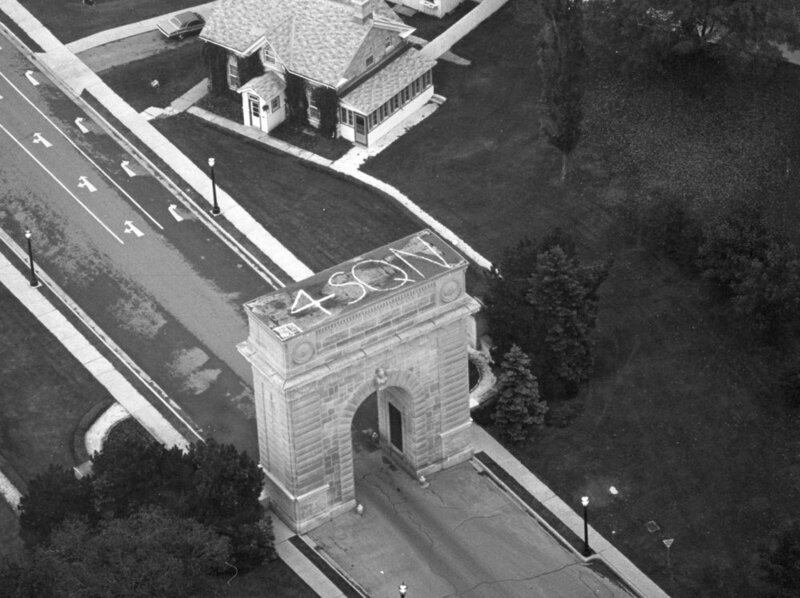 That photograph quickly became the talk of not only the Wing but also the College and made the front page of the RMC newspaper, appropriately named The Arch. Ironically, the only one who apparently was not impressed was their own CSL who was an engineer and feared possible damage from the paint, later unfounded. “The admittance of women to Royal Military College was a given a sneak - and totally unexpected - preview last weekend. As the gentlemen cadets paraded for the commandant on Sunday, there appeared among the ranks of Squadron 7 a long-haired gentlewoman cadet, with boots shining and a Canadian Army FN rifle on her shoulder. She went through the marching routine and the shoulder arms, fix bayonet movements without a flaw, and as expected the prank instigated by the RMC cadets did not go unnoticed by Brig.Gen. A.J.G. de Chastelain. 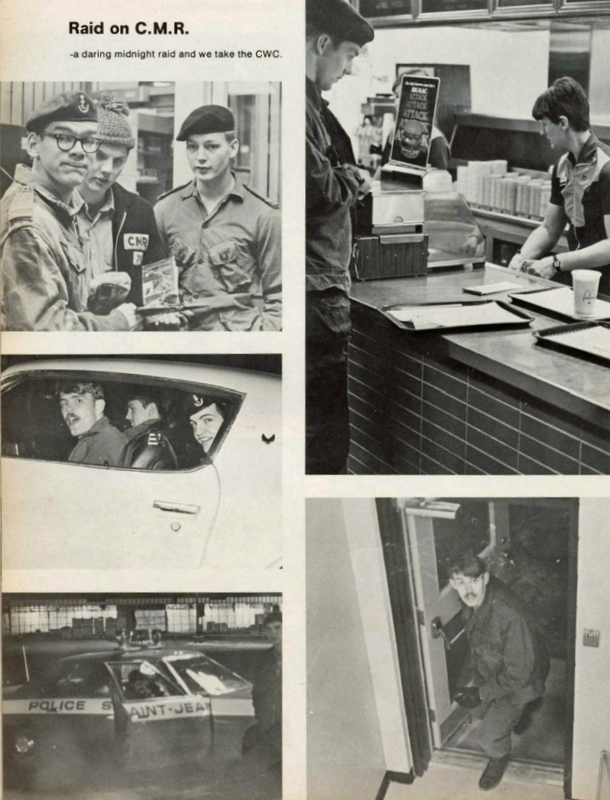 The new “recruit” was Suzanne Bell, an 18-year-old modern language student (Russian) from Queen’s University. A native of Montreal, fluent in French and majoring in Russian, Miss Bell has no aspirations to enter RMC, although she has a particular interest in one unnamed cadet. It was just a joke she said. “I spent Saturday afternoon toting a rifle around Fort Frederick (practicing). I certainly was not as perfect as the cadets but I knew all the movements and managed them. “I was on parade the whole morning. It certainly was a lot of fun but the rifle gets awfully heavy - it weighs 10 pounds. Fixing bayonets was a bit scary at first but you get used to it. The reaction from the college officials was calm. “It’s one of the best jokes the cadets have pulled” said an aide to the commandant. “Cadet” Bell took the uniform Saturday night and got dressed Sunday morning at her own room in the Victoria Hall residence at Queen’s before joining the ranks outside the barracks … Her fellow cadets pulled off their part of the ruse with the typical poker face of the military. “Cadets are not permitted to smile [on parade]” she explained. Not every Skylark was successful! Not sure who had the brainstorm, but our Recruits decided to try to rescue the sword on top of Yeo Hall. Crazy to be sure, just because of how difficult it was to even get on the sloped metal roof, never mind trying to get to the top of the spire. As it turns out, we would have needed an acetylene torch because that sword was welded on solid. Thankfully, everyone got down okay, although that was thanks in part to the fact that they had anti-ice railings on the very slippery roof.